We are providing WonderLook SDK so that other software can use color management and LUT management functions of WonderLookPro. By implementing the SDK into other application, the application can use WonderLookPro functions. The SDK has Windows version and MacOS version. WonderLook SDK will achieve following functions in your application. SDR to HDR, HDR to SDR and so on. 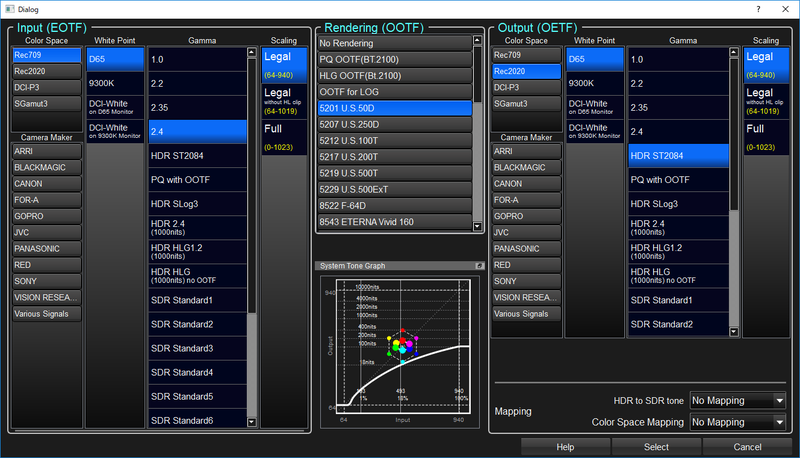 Not only representative SLOG, or LogC, but also various camera color spaces are available by TVLogic's own measurement of the camera profiles. Adding to color space conversion, you can add OOTF/Rendering transform. These transforms are defined ACES input/output, so these can apply to any conversion. GUI, which is the same with WonderLookPro can be used to set the input/output color spaces and rendering selection. LUTs for input color space to given grading space, and given grading space to output color space, can be generated. LUT of rendering which input/output is given grading space can be generated. LUT binary information which is float array can be obtained. The functions of the SDK has limitations depending on the WonderLookPro License in the PC. For Standard license or above, all of the functions are available. If there is no license on the PC, the grid count of the LUT is restricted to 5 grids. The profile of camera color spaces can be downloadable from TVLogic server through SDK or WonderLookPro software. To use rendering, you have to install WonderLookPro and download rendering sets by WonderLookPro. 9 for only one camera color space you selected. 17 for selected 4 type of cameras. No restriction for camera type. We are providing sample application with source code to confirm the SDK's functionality. Following is the explanation of the SDK based on the function of the sample application. The application consists form following 7 regeons. Initializing the SDK and obtain WonderLookPro license information. It will show the limitations of grid count. Selection of the number of grid count of 3DLUT and grading space. After selecting parameters on section 2, you can show the color space conversion dialog to select input / ouptput color spaces to be transformed. LUTs are created and the pointers of them will be returned. 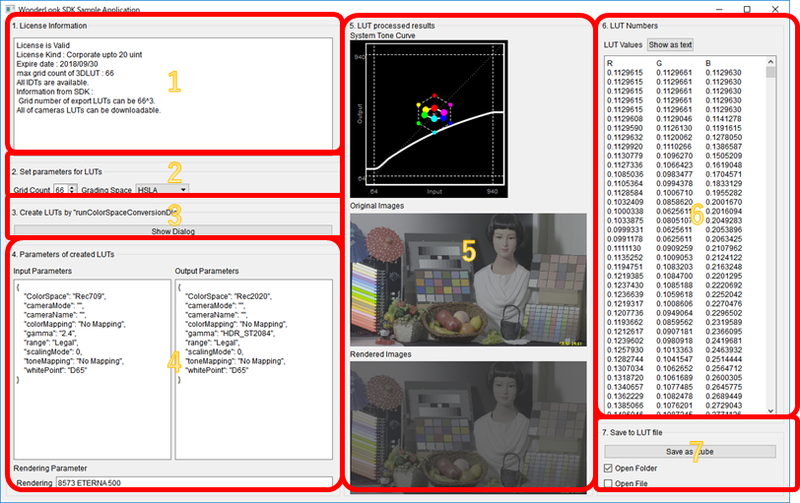 The parameters of created LUTs are shown here. You can create LUTs by using these parameters without showing the dialog. The system tone curve of the created LUT and LUT processed images are shown here. The button creates visible numerical text tables of the LUT. The LUT can be saved as .cube file. There are a couple of APIs we did not used in this application. WLP_SDK can be used just after calling WLP_Initialize. You can finish using the SDK by calling WLP_Initialize . After initialization, we recommend you to check the license by WLP_GetLicenseInfo. WLP_SDK uses "LUT Object". Memory management of "LUT Object" is taken by SDK, but the apllication have to manage the handle of "LUT Object". WLP_CreateLut can create "LUT Object". Before finishing application, please release the "LUT Object" by WLP_DeleteLut. Just after created, the "LUT Object" has no transform information. By calling, WLP_RunColorSpaceConversionDlg,WLP_SetInputLutFromName,WLP_SetOutputLutFromName,WLP_combineLUT the SDK will set proper transfrom LUT information in the "LUT Object". The prepared "LUT Object" can be used for various operations. Getting float array binary data(WLP_GetLutBinary),saving .cube file (WLP_SaveToCubeFile)、or calculating interpolated color(WLP_InterpolateLut) are available functions. 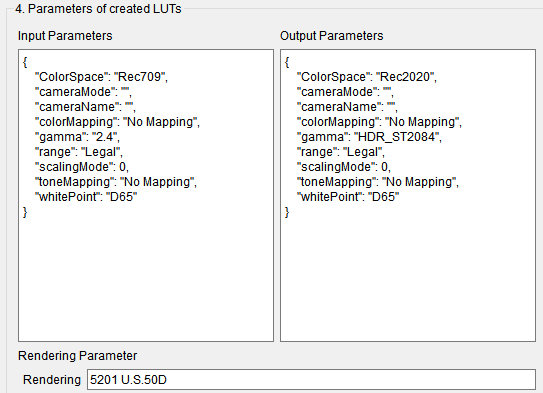 You have to select grading space when creating color space LUT in WLP_SDK. You can refer to here about the grading space. Grading space is very important when you are going to use input transform and output transform separately. If you will use only combined transform, you can use default grading space(HSLA). If you are going to use specific grading space, please get the available grading space list by WLP_AvailableGradingSpaceList, and select from them. Color Space Conversion Dialog is the center function of WLP_SDK. If you call WLP_RunColorSpaceConversionDlg with proper parameters, following dialog will appear. This dialog is the same dialog with WonderLookPro. Please refer here to get the detailed information. By clicking "Select Button", the parameters are decided and the dialog will close and the application will get the response. The LUT handle given by the application when calling the dialog, the proper LUT will be set to the objects and the essential parameter to create the LUT will be returned to the application. For the sample application, these information will be shown in the regeon 4. If the application keep this information, by calling WLP_SetInputLutFromName,WLP_SetOutputLutFromName with these information, you will be able to generate exactly the same LUT without showing the dialog.